Whether as a single workstation or integrated into production lines, the CombiLine Cube, available from Laser Resources , is an efficient solution for manual and automated laser marking. The CombiLine Cube has two modes of access. For easy job setup the CombiLine Cube laser marking machine front slides up to give wide access to the marking field. During production, the semiautomatic door provides access for short cycle times. The marking process is simply started by closing the door. At the end of the marking process, the door is automatically opened. A fully automatic door can be delivered as an option. The CombiLine Cube can both be prepared for manual feeding and for feeding through assembly line, robot or lifting and positioning device. The compact all-in-one desk top system can easily be integrated in any production environment. A support frame, which can additionally integrate 19" components, can be delivered as an option. 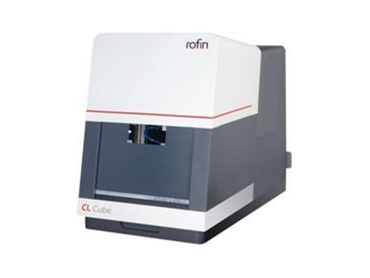 The ROFIN laser markers which can be integrated in the CombiLine Cube (PowerLine E Air 10 and 25 as well as PowerLine F 20) are completely air-cooled and nearly maintenance free. Due to different power ranges and beam characteristics, they cover wide application fields at low operating costs.